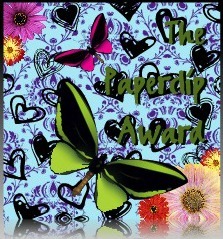 Many thanks to Hope over at ElvishJesusFreak for passing me the paperclip award! The award comes with some questions for me to answer. Here goes! 2. What is your ultimate favorite place to be? This is a tough one, I’ve been to some amazing places but to be honest my favourite one is home. Right now I’m really inspired by other writers and their journeys so I’m going to pick JK Rowling as her struggle for success keeps me going and I really admire her story-telling, charity work and courage. I can’t let the Brits down, I’ll have to say tea! I don’t drink coffee at all, never have. 5. If you could be any other person for 48 hours, who would you be? It’s hard to pick just one that stands out. I’m actually quite bad at remembering things, I tend to remember a photo of it instead. But I do remember having three imaginary friends when I was little so I’ll say that one. And look how it turned out – I still imagine people when I’m writing so I got an early start on that! 7. If you could ask anyone in the world, living or dead, anything, who would you ask, and what would you ask them? 8. What is the scariest thing you have ever done? I think leaving home to go to University was scary. As was getting a tattoo. But lately, quitting my job to focus on writing fits the bill. 10. Briefly explain one of the weirdest dreams you have ever had. Last night I dreamt I was in a restaurant with my mum and from the counter up to get food and she followed, leaving our bags under the table. When we came back, they’d been stolen. Mine was a white Juicy Couture bag, which I don’t even own. I was very unhappy with my mum in the dream. Werid. Pen. I haven’t used pencil since school. 13. Is 13 an unlucky number or not? I don’t think so. I don’t really have lucky or unlucky numbers. Aw, thanks Victoria! 🙂 Go Brits on the tea front! I don’t drink coffee either, hehe. You’re welcome!! Haha go tea! Oh, wow! Thanks for tagging me, Victoria! I love your answers. J.K Rowling inspires me, too. So does the possibility of making that kind of money and donating much of it to charities. Congratulations on the ‘nod’, Victoria. Home is my favorite place to be, too. Congratulations on your award, stumbled across your blog and your answer to number 8 interested me. Are you writing full time at the moment? This is pretty much my biggest ambition at the moment, don’t suppose it will happen for a long time though… a girl can dream though! I do have a blog if you fancy popping by and sharing your words of wisdom. I don’t drink coffee either. I also love Pride and Prejudice – in university I took a whole class dedicated to Jane Austen and I’d never read her before that. You’re welcome Rachel! Yay for P & P! Thanks Lynn! Haha sounds fancy, I like a good hot chocolate! Thanks Kourtney! I didn’t get into WH but maybe I need to try it again!